This is our Spring schedule for dance classes in Spokane Valley, WA at Maressa’s Spokane Dance School. Our schedule is subject to change, but we try to keep it updated as often as possible. If you have any questions regarding our dance lessons, please feel free to contact us. 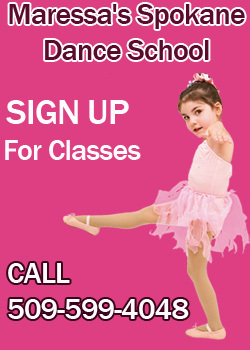 Our Summer Schedule is posted on the Summer Dance Classes Tab. Ballet II $130 Ages 9 – 11 yrs. Dress Code: Each level has a specific color leotard, and a matching skirt. Pink tights and ballet slippers are required For all ballet students. Black Jazz shoes are required for all Jazz/ Hip-Hop and Modern/Lyrical students. Please do not purchase dance shoes at Payless, Target, etc. Pilates classes have no uniform, but workout attire is suggested. All uniforms and dance shoes are available to purchase at our Studio.